First Lady Felecia Hughes is a native Washingtonian. She was appointed the First Lady of Faith Temple No.2, Original Free Will Baptist (OFWB), Church, Capitol Heights, MD, in October 2009. 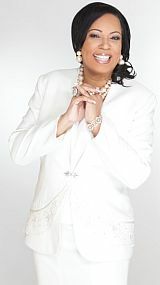 She additionally serves as the First Lady of the Middle Eastern District Original Free Will Baptist Conference of America, Inc., where her husband, Bishop LaVaughn Hughes, Sr., is the Presiding Prelate. She has held the position as First Lady of the Northern District Union where Bishop Hughes served as the President for many years. Lady Hughes is amazed at the power of God's ability to bring full circle her early passions for the youth, performing arts ministries and women's fellowship. Lady Hughes considered Faith Temple No.2 her "home church", even prior to her current assignment as First Lady. While previously attending Faith Temple No.2, she served as a Junior Missionary, served on the Sisterhood Auxiliary, and Choir No.2. She worked with the Sunshine Band and taught the children songs of praise in Sign Language. She truly thanks GOD for Bishop L. N. Forbes, the Founder of Faith Temple No.2. She credits Bishop L. N. Forbes and his spiritual teachings as a foundation and catalyst in her spiritual growth. Prior to their current positions at Faith Temple No.2, Bishop and Lady Hughes humbly submitted to the honorable Bishop L. N. Forbes' invitation to serve as the Pastor and First Lady of the Tabernacle of Praise OFWB Church, Waldorf, MD (aka T.O.P.) from January 2000 - 2009. She remained faithfully by her husband's side as the Director and Founder of T.O.P. 's Victorious Women's Ministry and the Daughters of Judah. As a visionary, she also implemented the Tutoring Ministry Program for the youth allowing parents and children the freedom to attend Tuesday Night Bible Study together as a family. She taught the women of T.O.P. how to remain holy, love their husbands, love their children and take care of their homes. She is truly a living example and upholds the characteristics of a Godly woman. Her favorite book of the Bible is Proverbs. As stated in Proverbs 31:30, Lady Hughes demonstrates and embodies the wisdom that "favor is deceitful, and beauty is vain: but a woman that feareth the Lord, she shall be praised." She continues to give GOD all praise and glory due unto Him. Lady Hughes was recently appointed the Director of Faith Temple No.2's Women's Ministry. In this capacity, she has been blessed to launch the Health and Fitness Ministry and soon to launch the Young Ladies' Liturgical Dance Ministry. First Lady Hughes is often reminded of her husband's humility and will always be by his side. She is honored to serve her GOD, her family and her church. Through their loving marriage of twenty-seven years, Bishop and Lady Hughes are blessed with three beautiful children: LaVaughn, Jr., a graduate of West Virginia Wesleyan College; Alecia Latrice', a junior at University of Maryland/Eastern Shore, and Crystal LaNae'. She is currently employed within the Department of Pediatrics and Child Health at Howard University Hospital in Washington, DC.